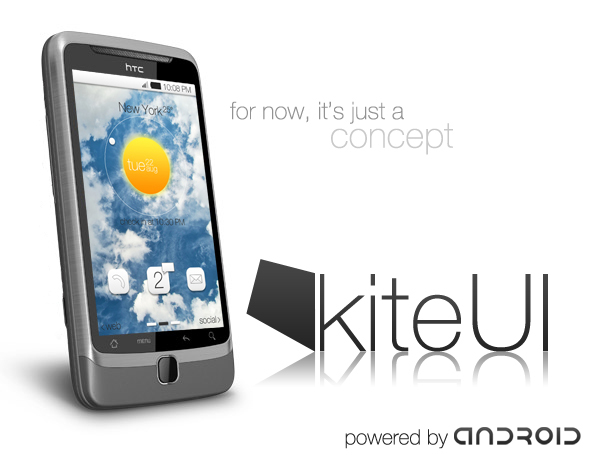 KiteUI Looks Sharp, Will It Move Past Just Being a “Concept”? A bold new Android concept called KiteUI has been in the works over at XDA for a good 2 months now and just this week emerged with video showing where the project is possibly headed. We’ve seen ideas like this in the past and always jump for joy thinking that they will be landing on our phones in a matter of weeks, but we all need to consider the amount of work that goes into a project this massive. KiteUI isn’t just another launcher or home replacement, it’s an entirely new interface (like HTC Sense) that will change the way your phone functions entirely. I’m not trying to shoot down everyone’s hopes, but if you want this puppy to come to life, you should start showing a ton of support for the developer in the source thread down below. Ask questions, provide feedback and if you know anything about coding, try to offer up your services. Just don’t spam off to him asking to be a tester. Please. And I’m off my little soapbox! The kite UI is built off of a pretty simple idea: You have 2-3 views in every app. Flicking left from the middle view will bring you to the right view and vice versa. While you are in the right view, for instance the ‘social’ view, you can dig deeper by pressing on a friend. If you want to move backwards in this view all you do is flick right. If you are in the left view you move backwards by flicking left. Simply put, when you’re going deeper within a certain view you move further away from the middle. Moving closer to the middle equals moving backwards until ultimately your on the first ‘level’ of the view. All of the KiteUI info you could ask for at this XDA thread. Who wants some KiteUI? Too bold of an idea? Too awesome to not add to your X-mas list?